Hello friends! I hope you had a great weekend! It is currently Sunday night at 10pm and 86 degrees INSIDE MY HOUSE. We came home after the boy's birthday lunch to find our air conditioner broke. It's supposed to be 100 degrees tomorrow, so please pray that it gets fixed fast. Parker already has a heat rash! Ok, enough about me. Here's a card I made with Ippity's Moonbeams and Heartstrings. The DP is 3 Bugs in a Rug. The ribbon is from my May Caffinated Cropper kit. The punch is Martha Stewart. Hop on over to the Ippity blog to see the full list of everyone participating in today's hop! Great baby card, thanks for sharing. I hope you get the air fix really fast. Just reading this makes me hot. Your card is adorable. Love that little train. Hope they fix your air soon!!!!! Your card is fab! Lovely card....hope your air-con is fixed soon! Wonderful job on this card, Ashley! oh love this card Ashley.. cute.. hope your air is fixed. it is a hot day here too. Ohh..this is just too cute!!! Love this! Maybe casing your idea for baby announcements. Hope your air is working! So adorable! So sorry to hear about your a/c! Oh gosh, this is really super cute! So precious, Ashley! Love this card! Hope you have the air going again!! Hope you can get that a/c fixed!! 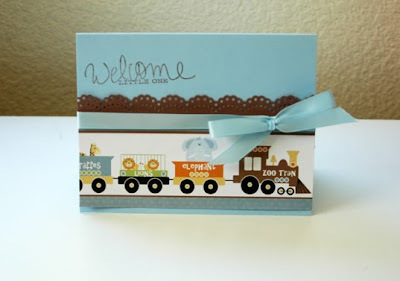 What a super sweet choo choo card! LOVE LOVE LOVE! So fab! Hugs cutie cutie! Such a cute cute card Ashley!